I will update this thread as work continues on this project. Utilizing a single IRF640 in switch mode class E and a beefy class A series modulator this project will be the new addition to my station. 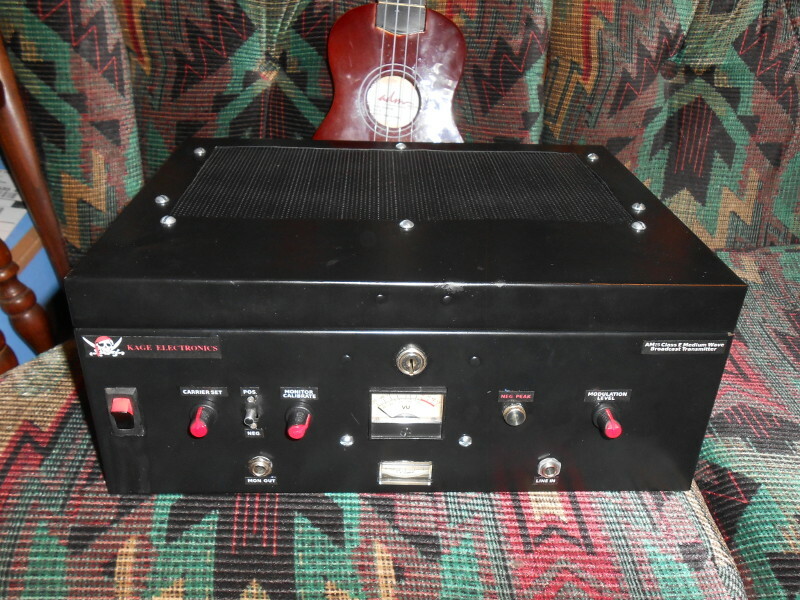 It easily pushes 100 watts PEP 100% modulated and can be pushed into higher positive modulation as long as proper audio processing is employed before feeding it. 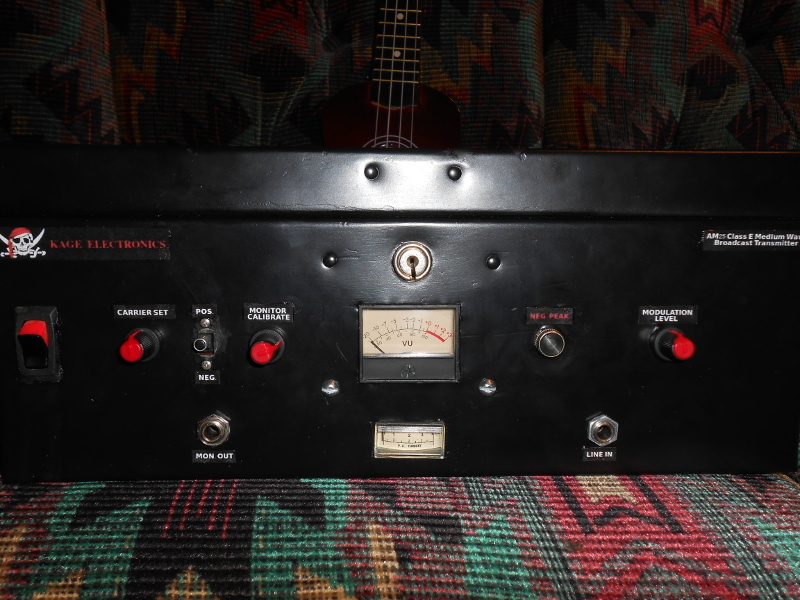 It currently has a built in negative peak indicator, carrier control to vary power from 0 to 30 watts (~25 watts being about the practical limit with test tone sine wave), will have a modulation monitor built in for headphone listening to test audio quality along with a modulation percent meter (currently a VU meter until new meter scale made). I know class A series modulation is old, clunky, and makes a nice egg cooker, but it's simple and provides excellent audio. I'm not worried about efficiency in the modulation department, and class E P.A. is incredibly simple to get running quick with quality results for the RF output so I chose this route. I could always upgrade the modulator in the future if I really desire PWM but for now simplicity and old techniques gets the job done. It starts here, HCT40103 8-bit synchronous down counter, CD4060 oscillator, and not shown the SN74LV4046 phased locked loop PLL, these three parts build the groundwork for the AM transmitters frequency generator thanks to Texas Instruments for free sample parts, better known as the common 3 IC chip PLL MW synthesizer that is well known and "just works". 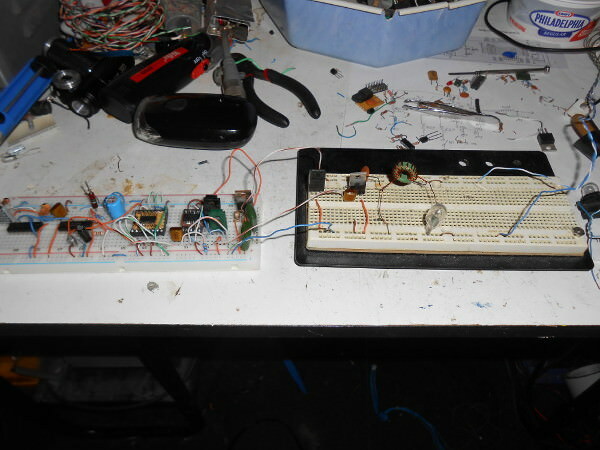 Because I only had the TTL version of the 4046 I had to run these at 5 volts. 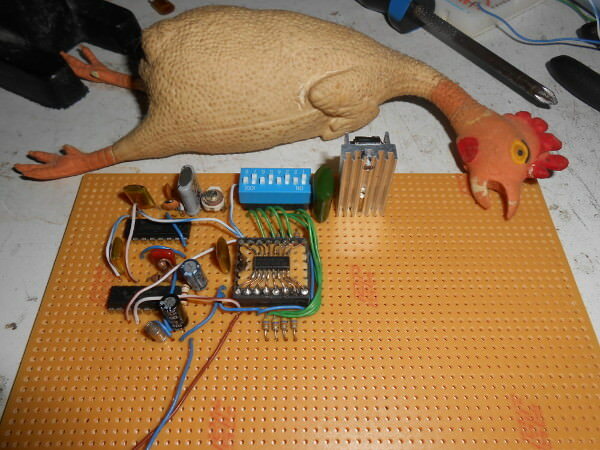 That's a problem because our MOSFETs like around 12 volt gate drive to saturate them, this is handled by the totem pole driver circuit with a transistor ahead of it to boost square wave voltage from 5 to 12v and allows duty cycle adjustment. Some of the part values for the SN74LV4046 circuit needed to be adjusted too since the PLL can easily go out to 12MHz or so. I will eventually show this in a schematic down the road. 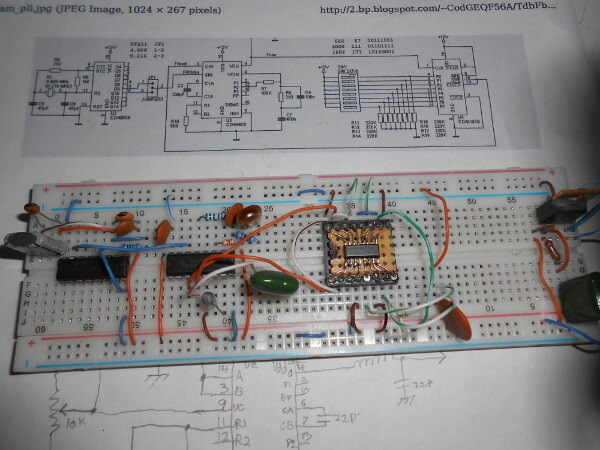 Remind me to get a larger breadboard in the future. Totem pole driver test stage and a simple MOSFET test circuit to confirm the circuit will work. At this stage I am feeling like this project might be possible and worthy of continuing. This old 3 IC circuit is as stable as a tank. Totem pole drivers and 7812/7805 regulators on small heat sinks because the IRF640 has a lot of capacitance at the gate and is not the easiest to drive. This bruit force square output is also capable of driving larger MOSFETs so in the future there's a potential upgrade path. Rubber chicken for good luck. 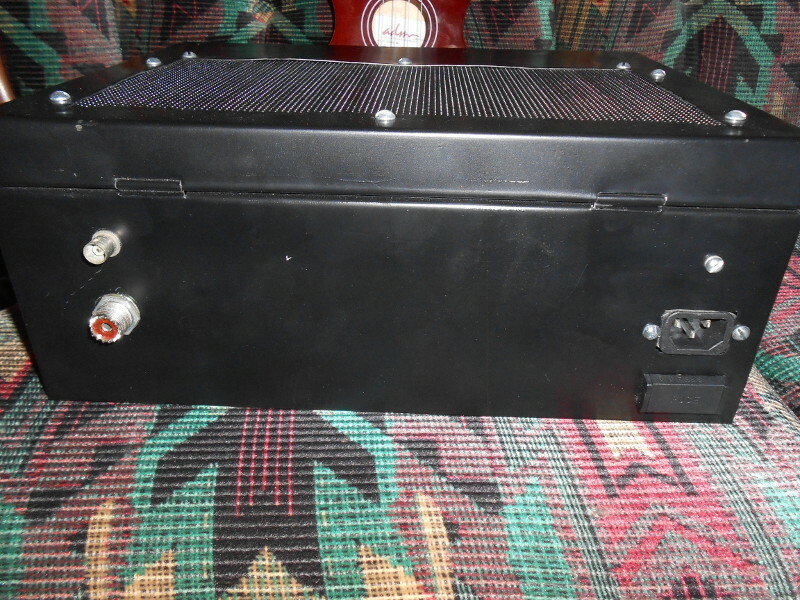 The series modulator built for overkill. 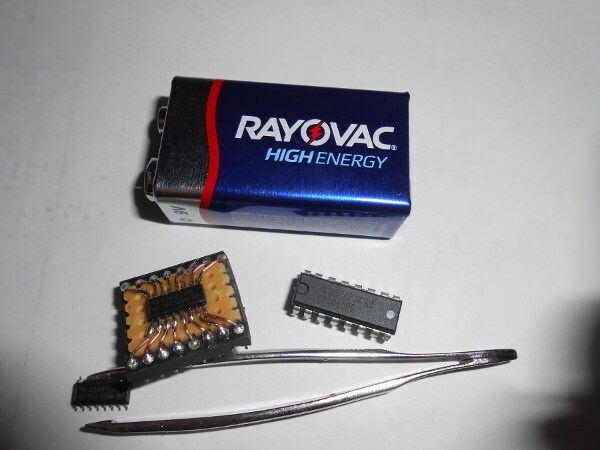 These transistors came out of an old stereo amplifier capable of over 120 watts audio. 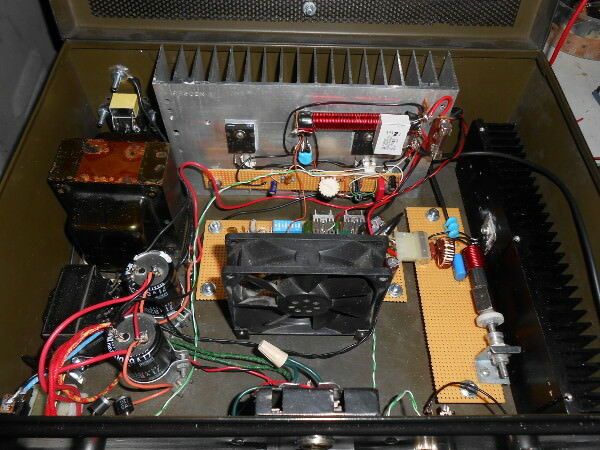 Driver transistor in the center, and bottom center is a very large OP Amp made for HIFI amplification. That part alone was overkill, but it was a free sample part so no loss to me. I would have used a standard OP Amp but this thing sees over 40 volts and most OP Amps can only handle up to 30 volts rail-to-rail. Later on I added a ferrite choke and terminal strip for easy connection and removal for repairs. This was originally a file box, where the air vent is there originally was a carrying handle. This wasn't easy to cut up because the thinner metal likes to vibrate and chew up with a jig saw. Cool thing is the top is held shut by key. 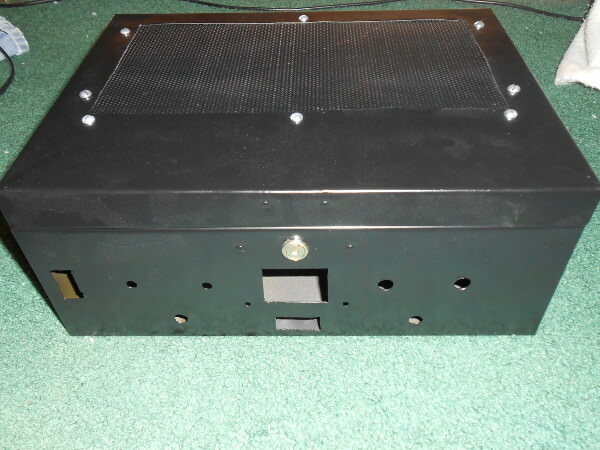 No need for screws, it's almost like a tamper safe enclosure that can easily be opened for internal adjustments. 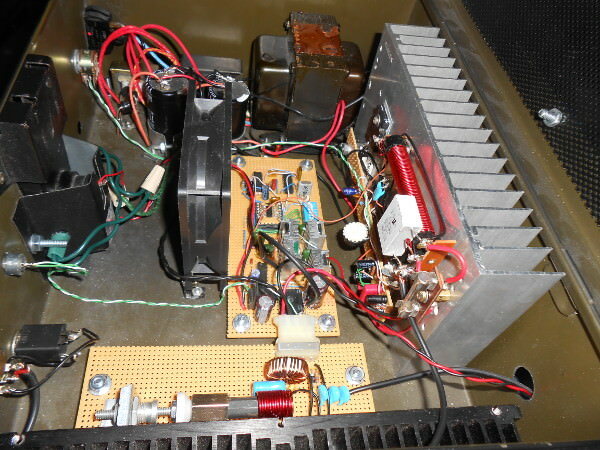 This was originally a meter out of a junked CB radio. I took the original scale out and put a piece of paper in its place. Wired it up as a current meter across the power supply choke and measured it against my multimeter in series using its amps setting. Cranking the carrier level up slowly and marking with pencil each amp comparing it to my multimeters measurement to get it accurate. Finally I took my pencil marked paper scale, scanned it into a computer, redrew it with paint software, and printed it out the exact same size for a professional looking amperes scale plate. 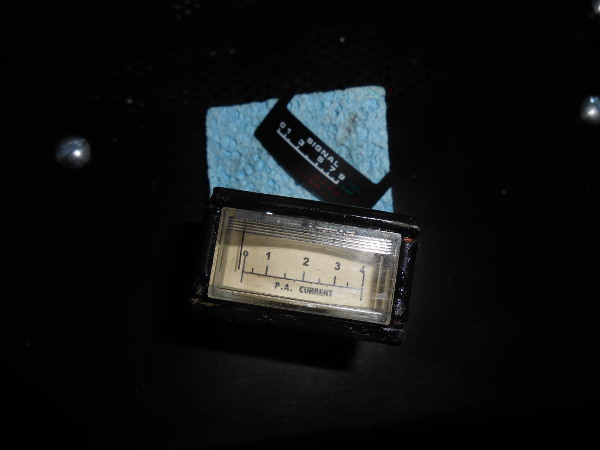 Popped it into the meter and it looks like a professional scale now that is accurate to the transmitters P.A. current draw. Whew.. Finally... power supply wired up and tested. 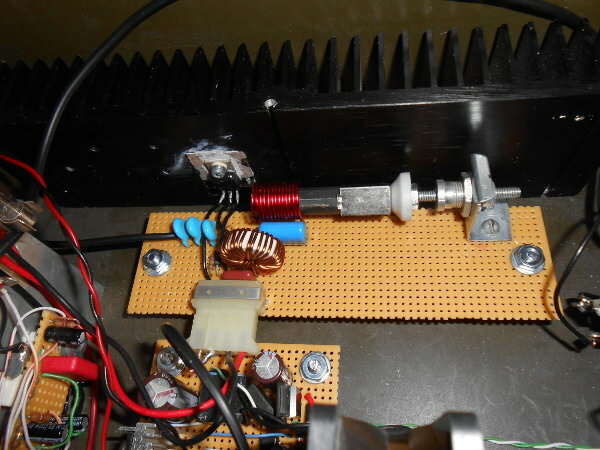 Large black transformer for RF output supply, Smaller transformer for digital synth and accessory power, smallest transformer is the hand wound power smoothing choke. Fan is on its own 7812 regulator to keep fan noise out of the digital circuits. Not shown is the back of the unit where I have a removable fuse and IEC three pin power connector for safety and quick disconnect. Look close at the meter area with the green wires... yes those are Christmas lights shoved into the back plate to light up the meters. Feeling festive with Christmas around the corner Cheap lighting and easy to find replacement bulbs. 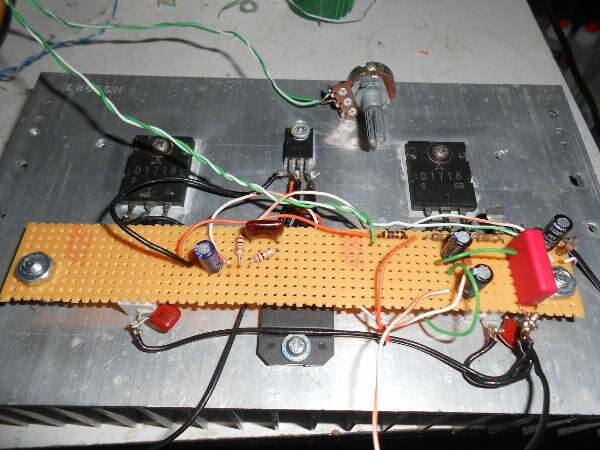 The red coil is the Class E output inductor. I made an adjustable ferrite that can be screwed in/out with the white thumb wheel on the bolt. This allows the narrow bandwidth output stage to be "tuned" from around 1000kHz to 1800kHz for maximum efficiency and cleanest signal. Also yes that is a huge heat sink, definitely overkill for the MOSFET as it barely gets warm at full power, but I wanted to leave extra for potential higher power upgrades in the future. This is where I'm at currently. 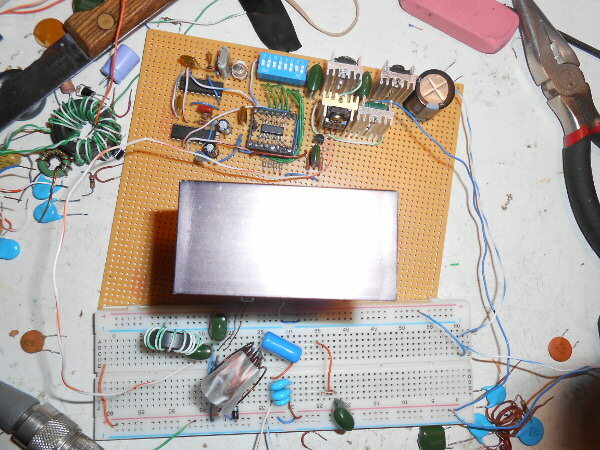 It's a functional transmitter at this point, just missing the 3 or 5 pole output harmonic filter and SO-239 output jack. Modulation monitor jack and calibration control needs to be added yet along with corresponding circuitry, VU meter will technically be a modulation % meter, not sure if I will make a special scale for it or leave it as is yet. I hope this post gets others motivated and inspired to start building! There is more work to be done yet but my project has come this far, only took half a year mostly from laziness and being busy with other stuff. Can't wait to put it on the air! 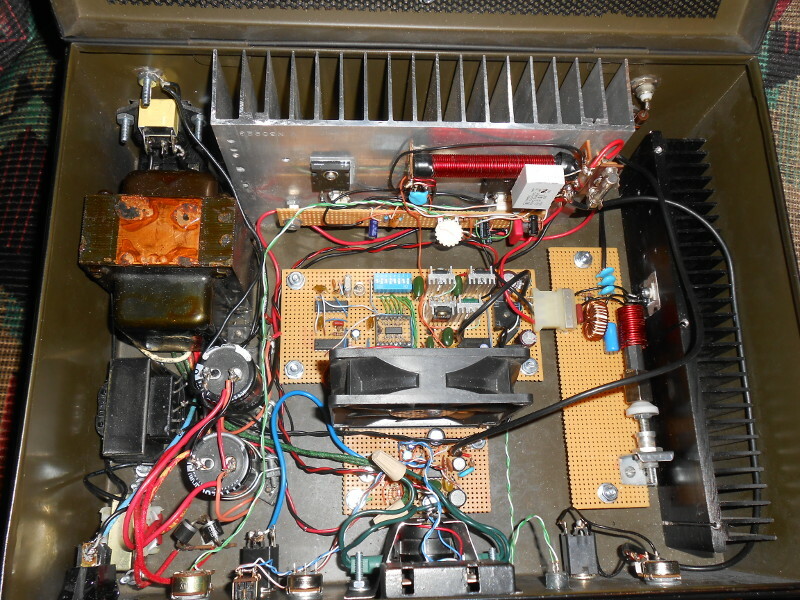 I highly recommend that design to anyone wanting to build a similar transmitter! That one uses a class D modulator whereas I chose to go with series modulation. I will post schematics eventually along with finished photos. Final internal picture before zip ties make the wiring look more nifty..
Back of unit, added a BNC oscilloscope monitoring output..
Like all projects, it ends in dial and button labeling just in case another owner ever acquires it.. Sometime after Christmas I will take the time to draw up schematics for everything and add it to this thread. It's going to take some time though as I have an entire folder of notes and sketches on this entire thing I need to dig through. 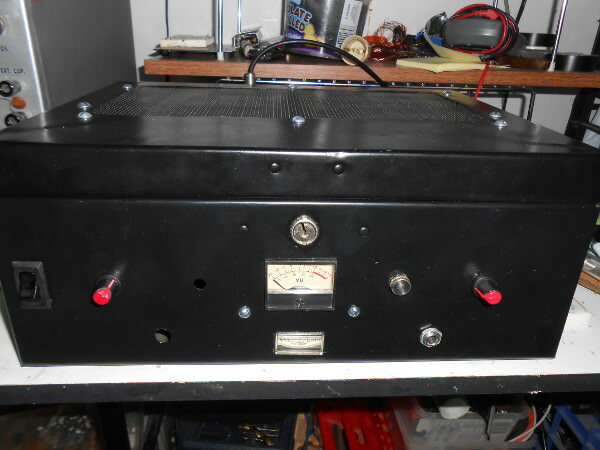 I had to build a "tandem match" SWR meter for it because things were not sounding right when modulated 100% positive using only an ammeter current meter on the antenna side for tune-up. The ammeter definitely works for a quick tune into a random long wire to see if maximum current is being forwarded to the aerial, it's the same as the old light bulb trick inline with the antenna where one tunes for maximum brightness then shorts the bulb out for actual broadcasting like a lot of Part 15 operators do with "grain of wheat" light bulbs, but with class E RF output and other oddities in the transmission line a real SWR meter for medium wave is a must. 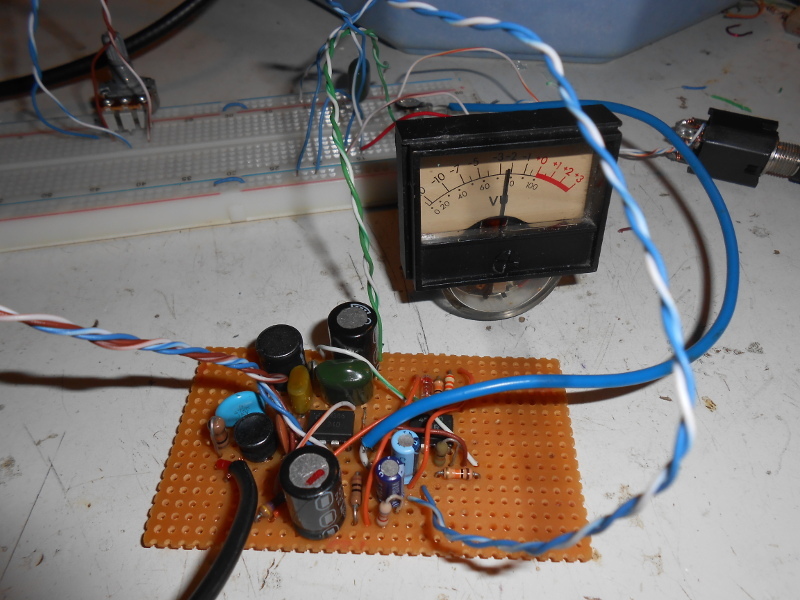 I don't have the luxury of a Bird meter and cheap CB radio meters don't really work down to low HF so luckily it was easy to build a tandem match meter and I will make a post about that sometime in the future too. Dual meters, one for RF output and one for RF foldback definitely help greatly compared to switching a single meter or being in the dark with a single ammeter across the antenna line for max RF output.